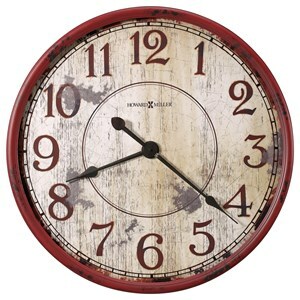 This 22.5" wall clock is designed for indoor or outdoor use. Sunburst frame is made of metal with a powder-coated case, tempered glass, and rubber seals protect the inside of the clock from inclement weather. The Wall Clocks Sunburst II Wall Clock by Howard Miller at Becker Furniture World in the Twin Cities, Minneapolis, St. Paul, Minnesota area. Product availability may vary. Contact us for the most current availability on this product.